Have you logged in to your account? You need to login to your account when you upload files. On the left below the "search" field on top of the "participate" box, you'll find an "Upload file" link. Clicking the link you will find the Commons:Upload page, which contains a very important legal disclaimer. This is a must-read to briefly learn about the legal requirements files have to adhere to and the license conditions available. It's in your best interest to read this thoroughly, as non-complying files will be deleted without further warning. In short, due to Wikimedia Commons' Licensing Policy, it is required that files may be reused and modified for any purpose with or without the author's consent. If you are not sure which license to choose, see the recommended license. In doubt, don't hesitate to ask at Commons talk:Licensing before uploading your files. 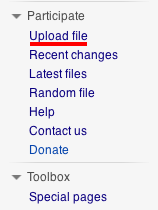 Below the legal text is the upload form. To select the file on your computer, click onto the "Browse" button next to the field "Local filename". This will pop up a file selection dialog. Once you've selected the file and pressed "Ok" the text field contains its path. The "Destination filename" is the file name that will be used for the link of uploaded image page. (Warning: if you enter nothing here, your local filename will be used.) You should use a descriptive name and follow the draft Commons language policy and/or the Wikipedia naming conventions for the language used, which give guidance on capitalisation, non-alphanumeric characters, etc. Don't use a non-descriptive name like "DSC123456.jpg" from a digital camera. Cryptic names for images make them a lot harder to find and use, and if you use a default filename from your camera it's much more likely that someone else will accidentally overwrite your image. This is especially important in Wikimedia Commons, because you can't rename an image file yourself once it's been uploaded (you need assistance from an admin/file mover). If you have no idea of a suitable file name, or if the name you were thinking of is already being used, use the category name and add the date of creation (West facade of Notre-Dame de Paris, 2009-05-26.jpg for a file intended for Category:West facade of Notre-Dame de Paris). Except for minor technical corrections, every file should be uploaded under a new name. The filename appertains to one concrete work: do not overwrite an older image even by a similar or better image of the same subject. Even if a diagram or map shows the status on a given date, it should not be overwritten with the status on another date (when you want to use a permanent link in other projects which should be actualizable without next edits, you can use a link to a redirect page and the redirect page can be switched on occasions to the file which is just actual). If you copied it from another web site, provide a URL in the Source field. If you copied it from another Wiki media project, indicate which one (for example, "the German Wikipedia"), the author there, and the original filename (A link is best). For your upload to succeed you will need either to select a license in the 'Licensing' field or to add a license tag in the "Description" field. Don't do both, as that would make the license information appear twice. The Description field now offers a template for you to complete. Using it helps to present the information in a consistent style. If you are uploading a modified version of a file, the image description is not altered, but what you put in the Description will be shown in the "Comment" box of the "File history" table, further down the Image page. Explain the changes you have made. The next page, First steps/License selection explains licensing. Topics on this page are covered in more depth at First steps/Quality and description. Once your file is uploaded you should categorise it. See First steps/Sorting.